Working from his small home studio in Ballarat, Bren Luke creates intricate cross-hatched illustrations using pen and ink. Luke draws inspiration from Albrecht Durer’s 16th century engravings, Japanese woodcut prints, alternative comic artists, architecture, 1970’s television and cinema. 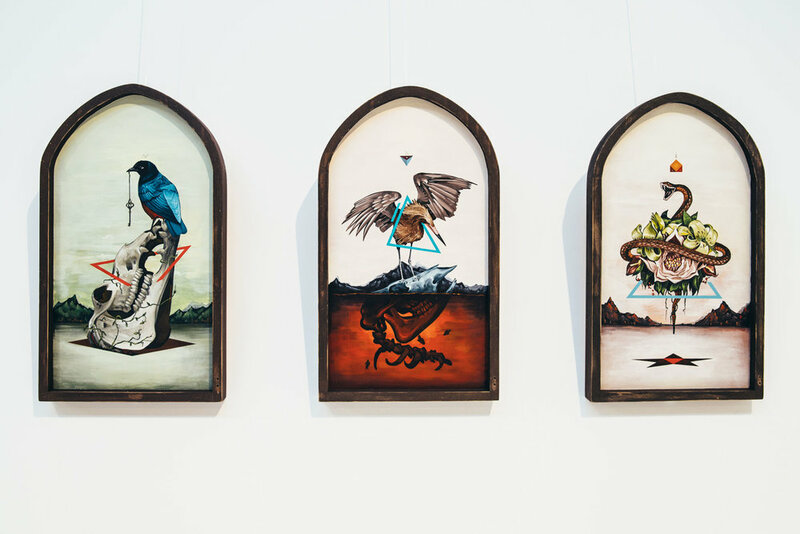 Writer Montana O'Neil caught up with the Sydney Art Pharmacy artist. 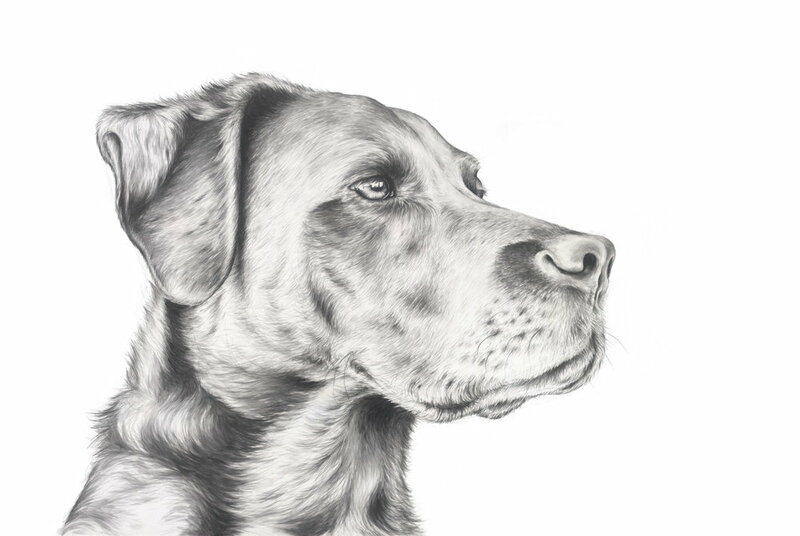 See Bonnie's work here. When Bonnie Porter Greene isn’t learning German, teaching her 13-year-old daughter the secrets of 35mm photography or editing articles for the collaborative website McPhee, she is busy in her studio with a paint brush and oil paints. We managed to catch up for a chat after her recent return from a creative retreat in California. Bonnie studied Fine Arts at West Wollongong TAFE, majoring in painting in the late 1990’s and has painted ever since. After having children, she explored other creative processes including textiles and collage out of convenience. However, she has always come back to oil paints as her medium of choice. The medium, as well as painting on board, allows her to be rough and energetic with her strokes adding energy and authenticity to the works. In the creation of her large scale, vibrant artworks Bonnie says, “I am drawn to beauty in the everyday.” From natural landscapes, shadows on hills and rooftops to decaying and abandoned ‘forgotten’ places. Following a trip to New Zealand, Bonnie began painting mountain lines, explaining that she was left with a series of very dark paintings. 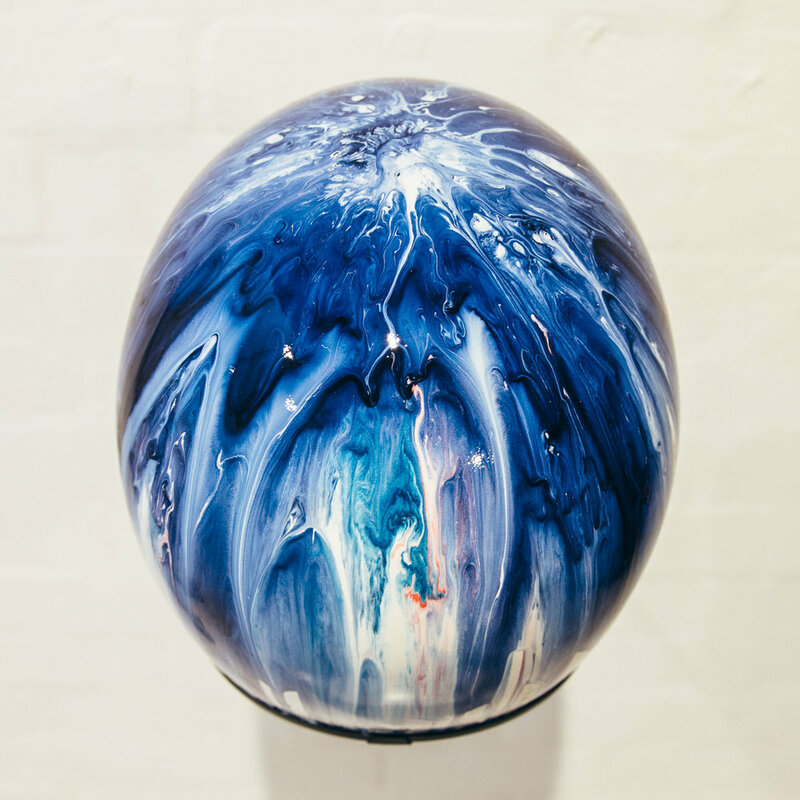 This darkness played on her emotional wellbeing as she said “[the experience] made me feel a little sad after being immersed in the dark paint for several weeks.” Since then she has produced artworks with vibrant and contrasting colour pallets which better reflect her state of mind. Bonnie’s creative practice is very organic, starting with a few drawings in her sketchbook and growing into the finished product. She says that, “just getting my paints out and beginning is sometimes enough of an inspiration. I try not to wait for inspiration to strike but just to begin something.” As if the brush has a mind of its own and complete artistic freedom. To keep these creative juices flowing, she never limits herself, working on multiple projects simultaneously, mixing with creative people and exercising and journaling daily. 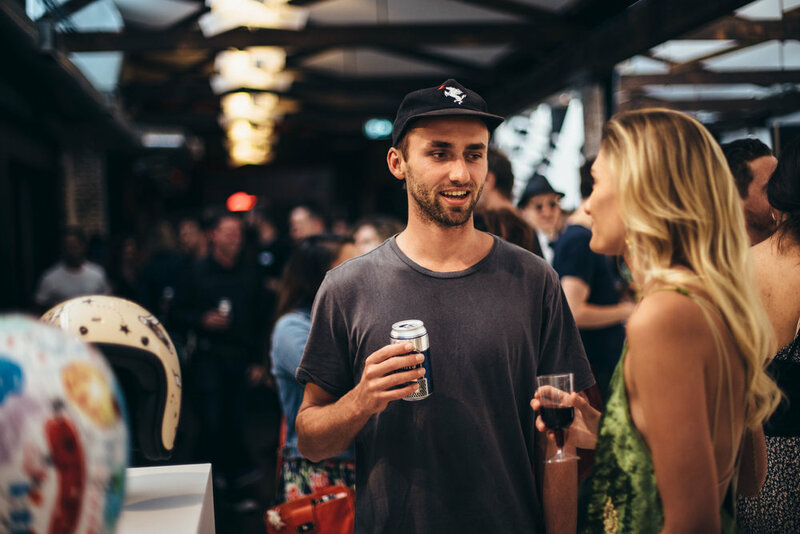 Last night at VANDAL Gallery was the opening of a unique art exhibition mixing a touch of gasoline culture with Australian contemporary art. 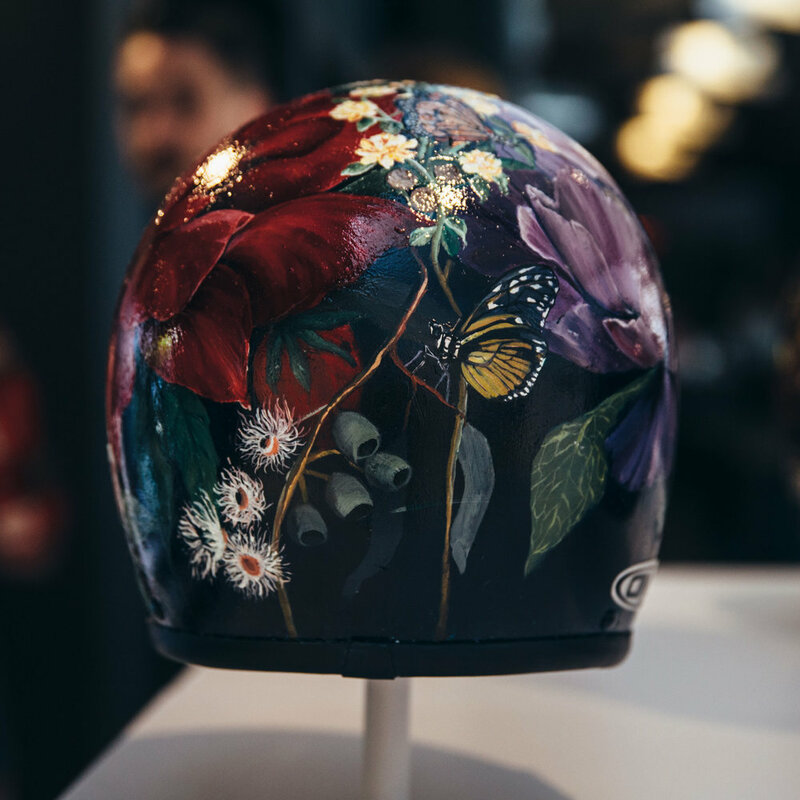 Art Pharmacy had the pleasure of collaborating with the guys from Sabotage Motorcycles to curate a show consisting of 20 DMD Helmets that have each been hand-painted by a hand-picked group of Sydney-based artists. With a truly wide range of styles, from renowned mural artists such as Scott Marsh, Sindy Sinn, Mike Watt, and Karen Farmer, to contemporary aboriginal artists Blak Douglas and Jason Wing, and the bold geometric styles of Nico, through to exceptional emerging talent such as Apeseven, Ingrid Wilson, Vincent Buret, Amy Roser, M-Lon and Skulk to name a few. The opening night saw well over 400 people through the door with Young Henrys and Sailor Jerry providing refreshments and some bids already placed! 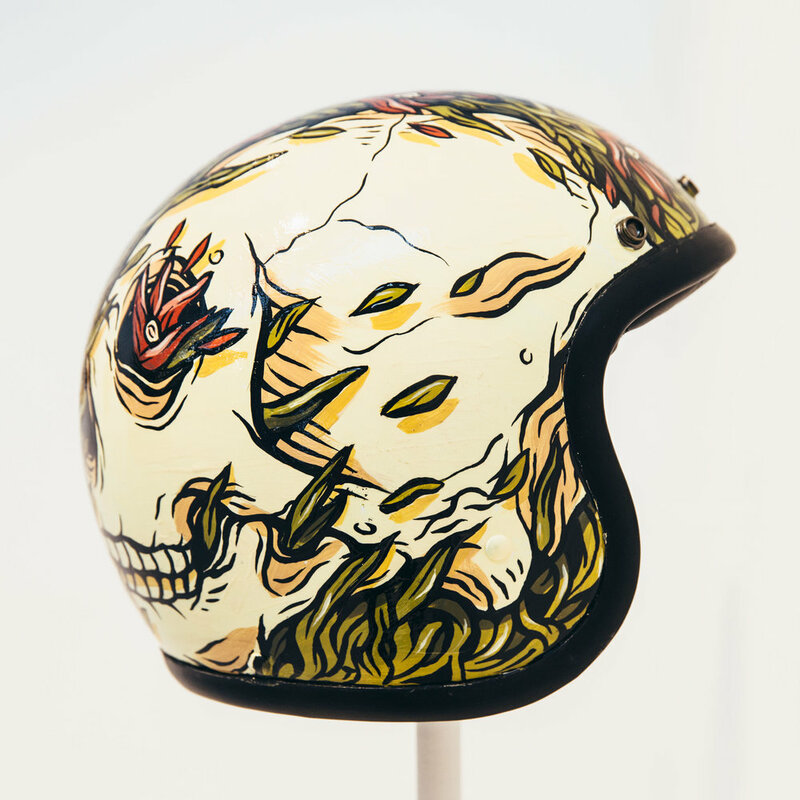 If you want to own one of these wearable and truly one-off works, then now's your only chance. They are being auctioned right now through eBay - but be quick, the auction ends on 7th December. 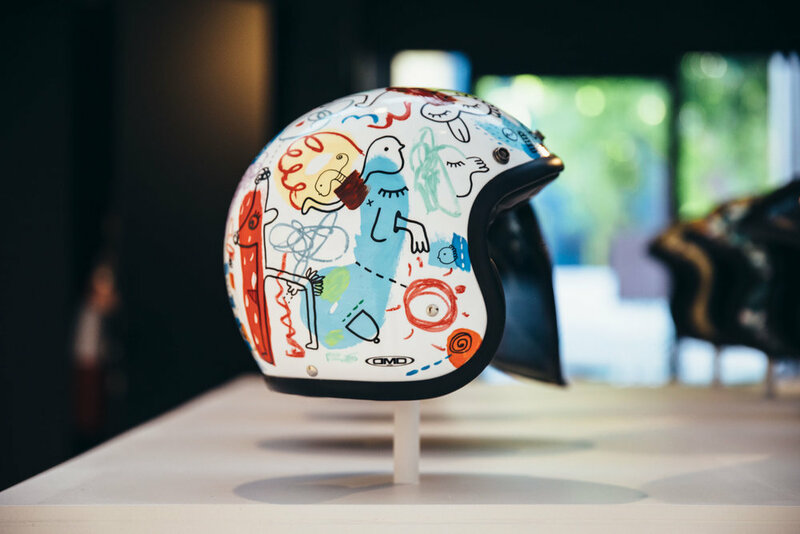 On top of that, 100% of the profits raised from the helmet auction will go to the incredible cause Movember Foundation, which funds research into men's health and prostate cancer. A huge amount of support has been given for this event, with DMD kindly providing the 'blank canvas' helmets, Smith Concepts have donated their time to clear-coat each one to ensure a shiny and durable finish, Vandal Sydney for the gallery space, and Throttle Roll for some great images of the night and also some of the artists working on the helmets in their studios. 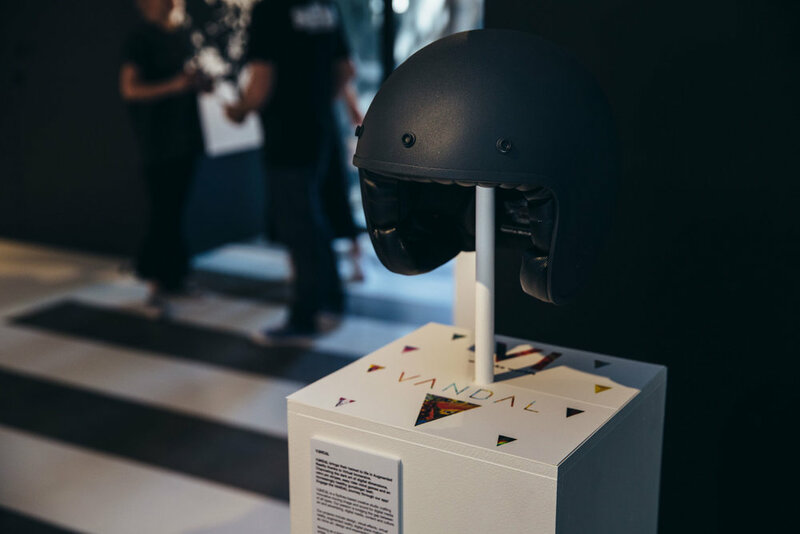 VANDAL even put their own spin on the exhibition with an incredible showcase of a superb augmented reality helmet! Special thanks to Pete Cangnacci for snapping away on the night! Bidding is live NOW on eBay, and closes 11.30am on 7th Dec! 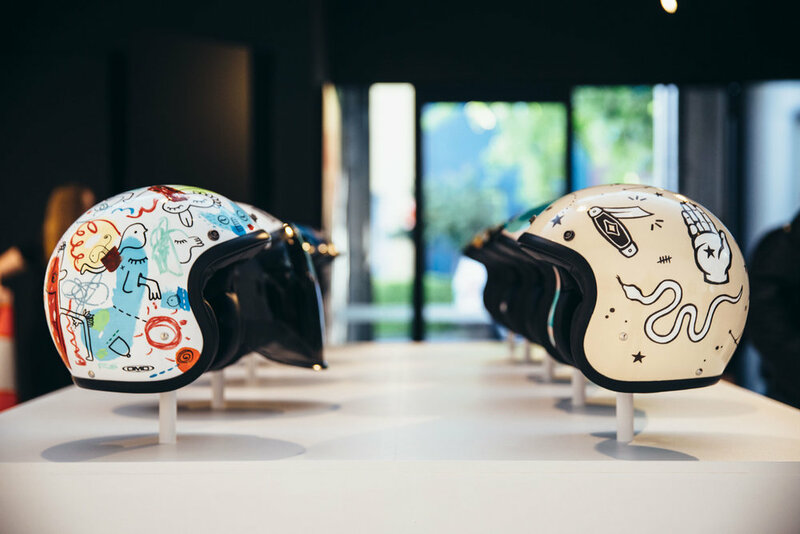 Art Pharmacy and Vandal Gallery are hosting a motorcycle helmet exhibition in conjunction with Sabotage Motorcycles with twenty of Sydney’s best artists decorating the helmets in their individual styles. 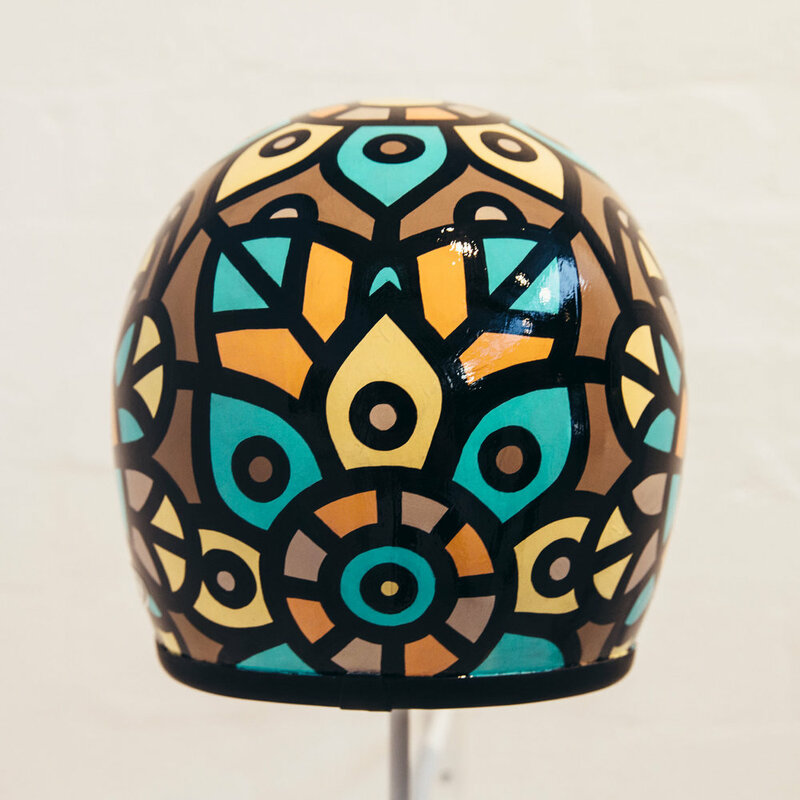 The helmets will be auctioned for charity via eBay, with 100% of profits going to Movember Foundation. There will be a gold coin donation for entry (or more if you’re feeling generous!) 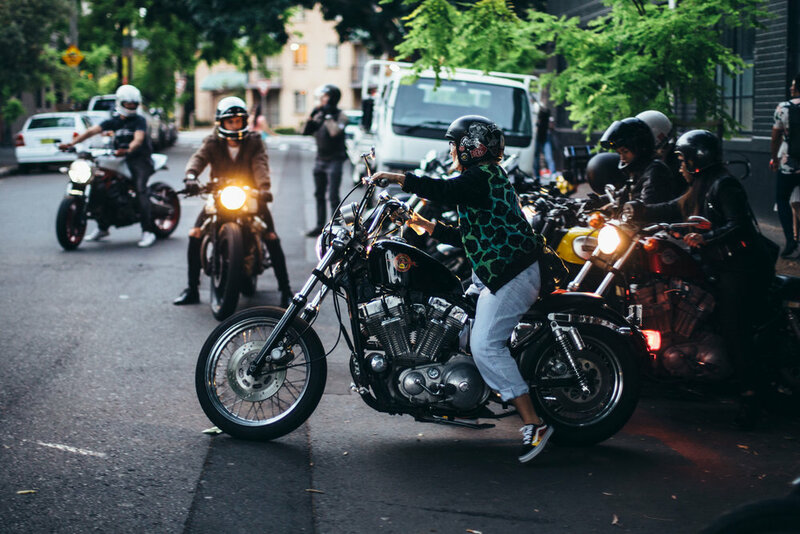 and drinks will be supplied by the lovely Young Henrys and Sailor Jerry teams. A big thanks to major sponsors DMD Helmets, Smith Concepts, and Throttle Roll! 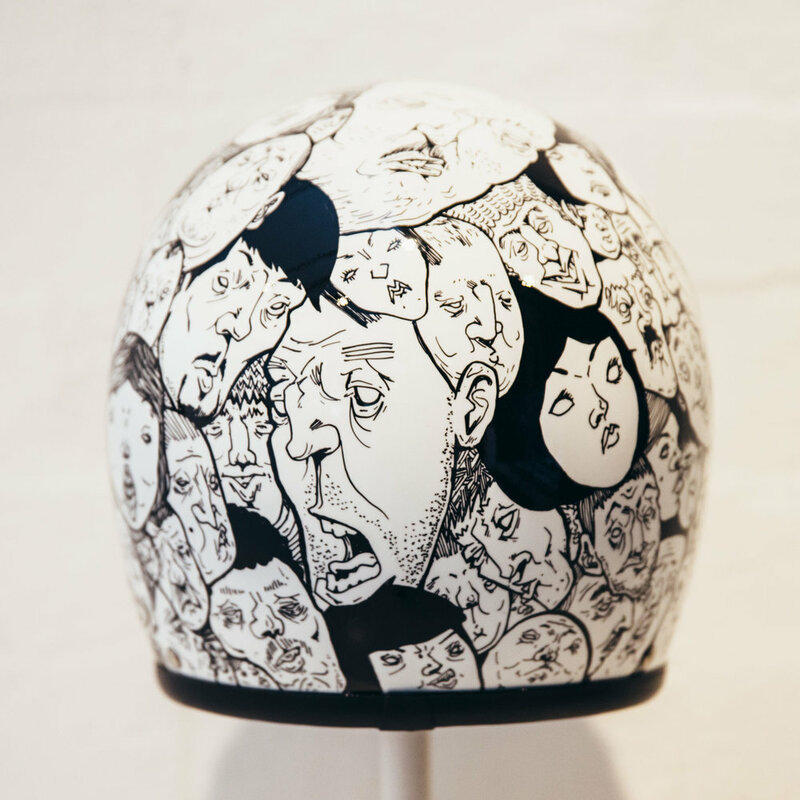 There's a broad range of styles from a long list of Sydney-based artists - Amy Roser, Sindy Sinn, Mike Watt, Chico @ INSACIOUS, Jason Wing, M-lon, Lauren Webster, Kentaro Yoshida, Vincent Buret, Skulk, Nev Sety, Scott Marsh, Blak Douglas, Karen Farmer, Ingrid Wilson, Nico, Ginger Taylor, Kyle Smith, Simon Lovelace, Apeseven, and Joi Murugavell. 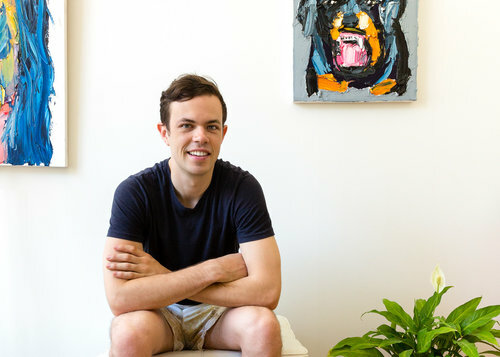 Bernard Greaves is a young artist from Sydney whose luscious oil paintings are reminiscent of Ben Quilty and Nicholas Harding with their thickly applied swathes of paints. Having trained as an architect, Bernard is once more exploring the realm of painting, something that he first dabbled in when in high school. When exactly did your love for art become obvious? I loved art from an early age. My earliest memories of loving art was from getting up early on a weekend when I was 5 or 6 years old and sketching in a book when my sisters were watching TV. When I was in primary school and people asked what I wanted to be when I was older I would say "an artist". Both my parents enjoyed the creative arts and they pushed me to work on my drawing/painting at a young age when I had spare time. From that age I knew that I loved art more than most. You are inspired by Australia as a whole, what does being Australian mean to you? This is a very interesting question that I'm not sure I have a straightforward answer to. Having spent considerable time living overseas in a developing country, returning to Australia has given me a different perspective on my own identity as an Australian. To me, being Australian means I have to recognise how extremely fortunate I am to be living in this country. By reflecting on this, I will understand that I have a duty to help others less fortunate than myself by firstly upholding values of respect, generosity and kindness to my neighbours. I am inspired by the "great outdoors", the Australian landscapes that give me a reason to share these through art. I am inspired by the Australian people that fight for human rights e.g. Ben Quilty, one of our most well known artists who speaks out against social injustice. Being Australian means I should show gratitude for these landscapes, these people but also the opportunities and freedoms the country has given me to grow. Being Australian means I must also question and criticise certain values that our Country can head towards, ideas that are fuelled by greed, fear and selfishness. Using Australia as a focus of my painting may hopefully help people reflect and discuss these ideas I've mentioned when viewing my work. Which skills as an architect have you seen transcend into your art? Probably learning rules of perspective, scale, composition, balance and ratios in building which can be translated to the artistic field. Architecture sits somewhere in the middle of science and art, and sometimes these principles can be easily transferred further to the artistic end of the spectrum. Understanding when something "works" is a skill that you slowly develop whilst learning these ideas. Creating iterations and pushing yourself to keep improving a design is another skill that can be transferred from the architecture/construction field to the canvas. What skill do you want to master, that you haven't quite mastered yet? I still have a long way to go as a painter before I am confident in my skills. I would like to be able to paint with more precision, paint with more flare and create my own identity as an artist. Because of the way I use the oil paint medium in thick strokes, I need to get better at showing finer detail on a smaller scale to avoid looking too messy and amateur. Also, I need to perfect different colour palettes to suit colour themes, so working on mixing certain types of paints, understanding different combinations and what works together is an important skill as a (thick) oil painting artist that I would like to develop. What are your top three sources of inspiration to fix a creative block? I always try and take photos on my phone when I am out and about. If ever I am struggling with ideas I might go through my phone, see something that I liked and try and paint it or some part of it. Could be landscapes around Sydney, people, objects or anything that I think would look cool hung up on a wall. Music is a great way to inspire me to get up and paint. Because of my style of painting is based heavily on movement and quick, short sessions in front of the canvas, music offers a great source of energy to get up and into a rhythm where I can start to "feel" the process a bit better. I will try and play something energetic, Hip Hop or some House tunes that get me moving around my space and bopping my head. It builds confidence and stops me from pausing and over-thinking my next move, which creates indecision and that shows up in the artwork. I always try and study my biggest art influencers. Ben Quilty, Guy Maestri, Nicholas Harding, Paul Ryan and Craig Waddell just to name a small few. All of these artists have reached great success in the Australian art scene and they all paint in the thick stroke/palette knife style of oil painting. Looking at their work closely and doing my best to understand their work always inspires me to pick up the knife and start slapping paint on the canvas. 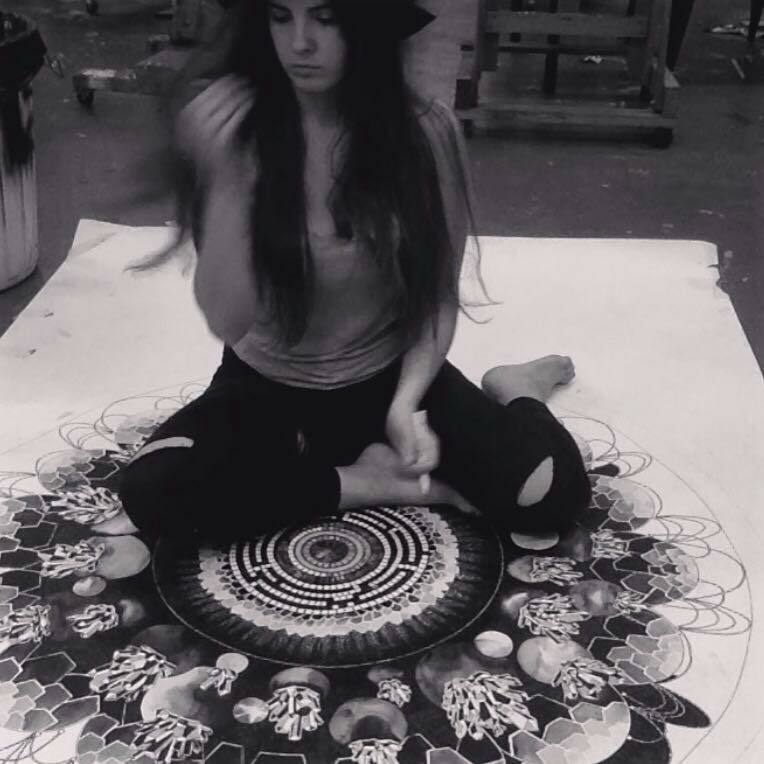 Talented emerging Sydney-based artist Jaimee Paul has an upcoming exhibition at Suki & Hugh Gallery, “All that you’ve become”. Featuring a body of watercolour paintings and drawings, she hopes to “foster memories in each of us; a story of family, of childhood, of connection, of loyalty and being proud of where we come from”. 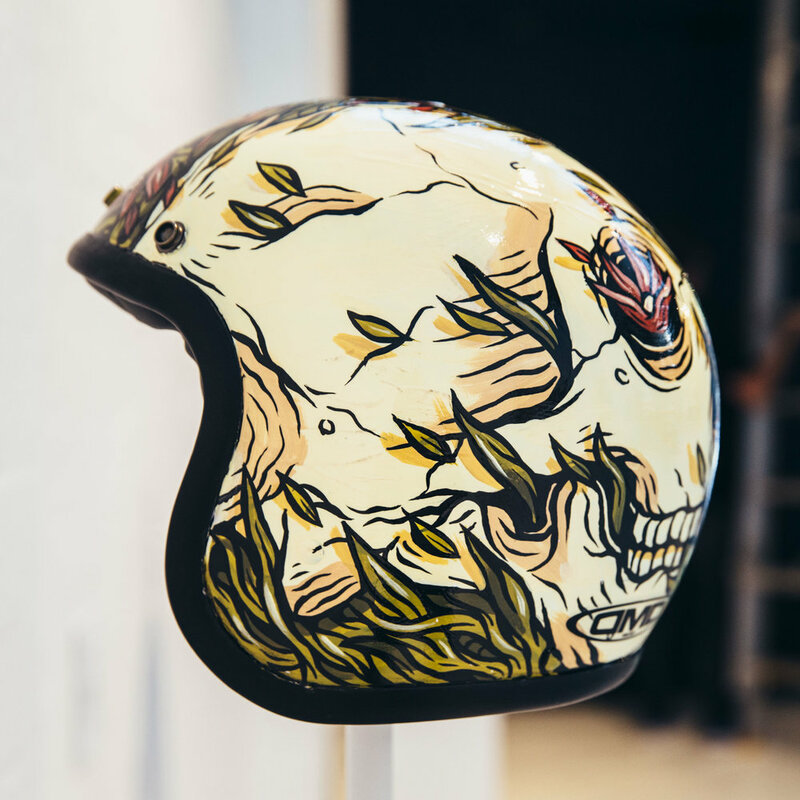 When she lost her father earlier this year she made the decision to channel her grief into her art to create something positive. Her father, Chris Paul, was a champion bull rider, dog whisperer and horse man. Jaimee who is a self-proclaimed environmental warrior herself often uses her practice to create awareness around endangered species. Jaimee believes: “Art has the power to evoke emotions from audiences not usually partial to stare inside the eyes and soul of a furry being. Fostering personal connections between human viewer and animal subject I hope to fulfil my purpose of creating meaningful art leading to positive changes in today’s global climate”. 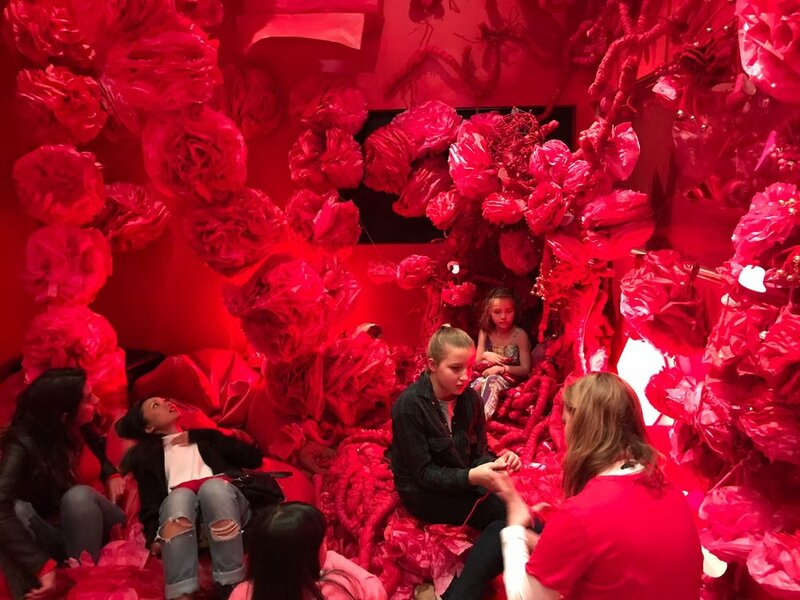 Artist Kate Robinson talks the complex paper designs that feature in her installation Couture in Bloom for Birkenhead Point Shopping Centre. This summer the Art Pharmacy team are bringing Birkenhead Point Centre to life through exciting installations by a number of established Australian artists, including Jo Neville AKA Paper Couture. 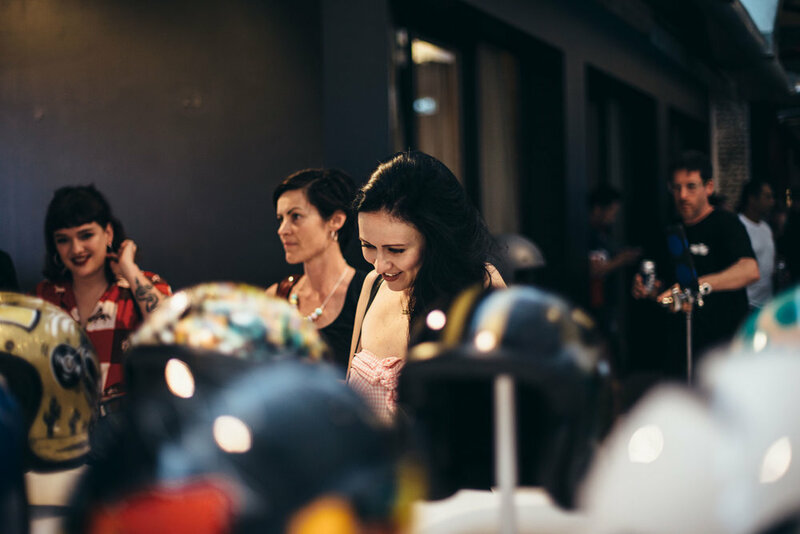 This week writer Louisa Tiley spoke to paper maestro Kate Robinson about her elaborate contribution to the Birkenhead Point space. A spacious window display will house Robinson’s intricate, paper-based dresses - a body of work titled Couture in Bloom. They’re dramatic and oversized, with butterfly laden skirts draping up the walls in a fan-like way. Read on to find out more about Robinson’s unique artistic approach, motivation behind her recent works and ongoing evolution as an artist. What are the steps in creating each piece (and how long does the process generally take)? I always start with a mood board. I collect images that I have sourced online from web searches and Instagram etc. I normally do this over a couple of weeks. Then I will narrow down my images to a moodboard of colours, textures and shapes that I think will work well. While I am collecting images I will be thinking about my own designs and shapes that I want to work with and this will determine the final moodboards. I will make some initial sketches and doodles on paper but I will mainly put my concepts together on the computer. Early concepts for Couture in Bloom. For this project, and previous paper outfits I have made, I don’t make final sketches of how the pieces will look. I find it easier to have a rough concept and then create the final design as I make the outfits, this allows me more freedom. How crucial is the butterfly symbol to this work? The butterfly is the key symbol in my outfits, they are symbols of transformation and growth but also of fragility, and paper can be such a fragile medium to work with. By not having a finalised sketch to base these pieces on I can adapt and change them as they come together. I think this element of the outfits growing into their own creation as I add butterflies reflects the symbol of the butterfly and metamorphosis. A close up of Kate Robinson’s paper butterflies. What’s the motivation behind your vibrant colour palette? As my work will be displayed in the warmer months, and the colour palette for Birkenhead Point was called bright summer, I wanted to make sure I used bright colours in my art project. Spring and summer are times for new life and growth and I thought that a rainbow of colours would reflect the season change and also reflect the new development for Birkenhead Point. Paper samples from Couture in Bloom. What materials do you use? And where do you source them? For this project I am working in mainly in paper. It's so tactile and it comes in so many textures, thicknesses and colours. I enjoy working out how paper can be manipulated to form different shapes, and that it can be beautiful flat as well as 3D. I liaise directly with paper houses to source my paper, as it means I can buy the sheets in a larger format and have access to a wider variety of thicknesses, finishes and colours. For the base construction of Couture in Bloom I have also used different bodysuits and an actual suit to adhere the paper butterflies to. The skirts of the butterflies are made from fishing line. 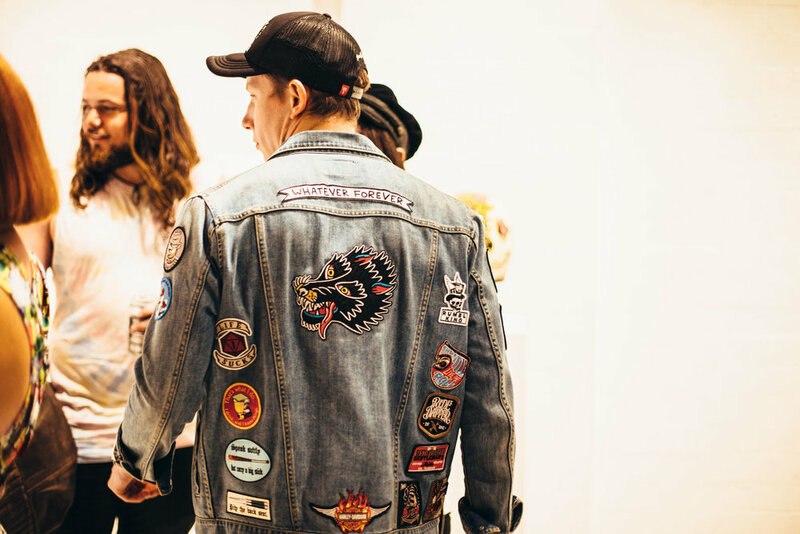 How do you view the relationship between fashion and art? I like the concept of fashion as art and I do not feel that art needs to be only hung on walls or shown in an art space. 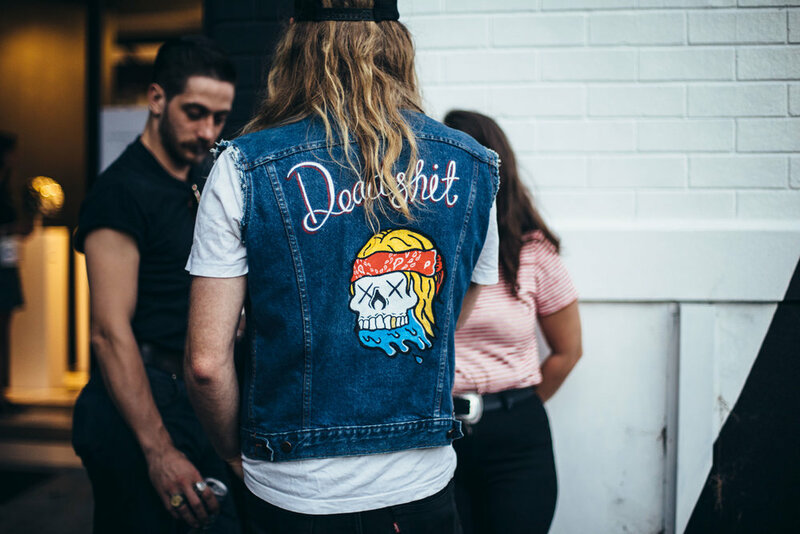 Fashion, like art, is about people having something to say and a way to express themselves. Have you encountered many challenges in the fashion space? The only fashion pieces I have ever created have been in paper, which can be quite a challenge in itself - but it’s the challenge I enjoy most. Working out how I can make paper into a material that can be draped like fabric really interests me as paper has a much more rigid fibre structure than most fabrics. When, how and why did you get into art making? I have always enjoyed drawing and creating art. I studied fine arts at university but ending up working in graphic design once I graduated. Since I started working fulltime in graphic design, I have created artworks in my own time through the medium of drawing, painting and papercuts. I saw a paper artist present at Semi Permanent in 2013 and decided I wanted to do that for a living. I have had some great opportunities over the past 4 years working in paper, and most of my paper works are commercial commissions. My next plan is to create a collection of personal paper pieces over the next 12 months, inspired by travels from the last few years - particularly the Moorish patterns and architecture from Spain, Morocco and India. Who is your art idol? I don’t have one art idol, but there are several artists that inspire me (although my own work doesn’t necessarily reflect their styles). 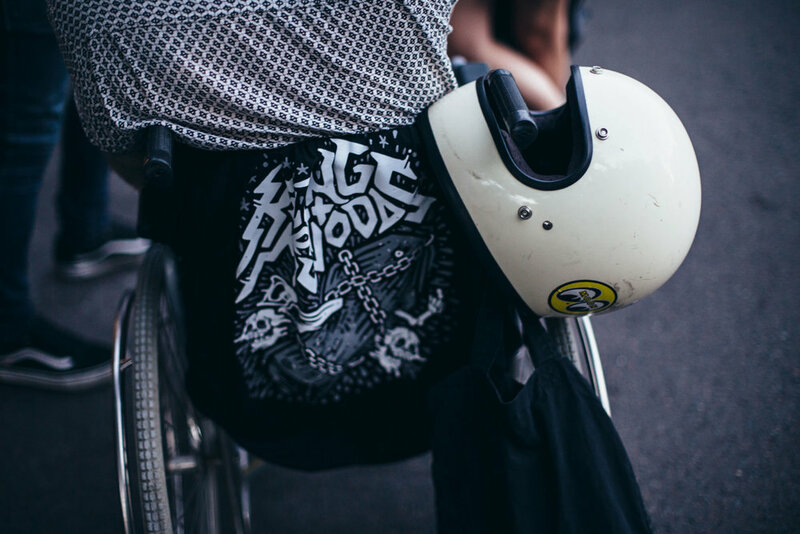 I really like the graphic, bold style of both Andy Warhol and Meggs, an Australia graffiti artist. I have worked in graphic design for the past 15 years and I can see similarities between their use and choices of colour in my own graphic design work. Other artists and their work that inspire me include John Lennon’s illustrations and paper artist Matt Shlian’s geometric pieces. You can view Robinson’s Couture in Bloom at Birkenhead Point from 3rd November 2017. Art Pharmacy artist and COFA graduate Luca Goczey creates works that are a meditative reflection of her personal experiences; with her dramatic black ink and watercolour creations create depth and a breaking of space. Being surrounded by art her whole life, Luca talks to Art Pharmacy about how her burgeoning body of work places an emphasis on symbolism, and why emerging artists motivate her. Growing up surrounded by art - what specifically drew you to art playing a role within your day to day life? Art was always a loveable habit of mine when I was younger, but continually throughout my life it became more of a conscious and necessary activity. Everyone has input and output channels which one uses to interact with the world. While for others this might be sport or even work, for me my most important outlet was drawing and creating. Your work presents strong systems of symbolism which reflects your experiences - how is this represented throughout certain aspects of your work? The symbolism within my work is present through various aspects such as colour, pattern and size each representing different people, places; and times. The colours in which I use within my practice play a huge role in referring to my different moods and times. For me I can see clear parallels can be drawn between my use of colour and periods of my life where as patterns usually represents people while as the use of size; and repetition visually portrays my mental states. Your artworks are bold and heavily feature a black and white colour scheme - what other art styles or artists have influenced your work? Many of my pieces I have at Art Pharmacy hold an appreciation to the clean and bold nature of black and white. By taking colour out of the equation my works become more focused on the subject matter. The use of black and white makes my drawings feel almost naked in a sense. In regards to my influences I wouldn't say that my art is heavily influenced by any particular artistic styles or any certain artists. But when I view my work I can definitely tell that I draw throughly from surrealism, romanticism and often oriental art as well. I know that I am following various talented artists on different social media platforms whom are all in a very similar career position as myself. For me it is very nice to be able to follow their progress; watch them grow and succeed. I find this motivates me more than any viewing any other famous artists progression. With a background in studying Painting and Philosophy - what connection do you feel exists between the two subject matters? When reading this question I can't say for sure that all philosophical themes have a connection to art, but the body of work I create and the philosophies I enjoy do go hand in hand. On the one hand, philosophy stands as a source of inspiration for me; reading topics such as consciousness; and metaphysics have inspired such imagery that over time for me. I have seen it slowly develop into my artworks. Whereas on the other hand, art has it's own individual department in philosophy, wherein that the aesthetics often explore the very nature of art. What projects do you have coming up or would like to work on in the future? 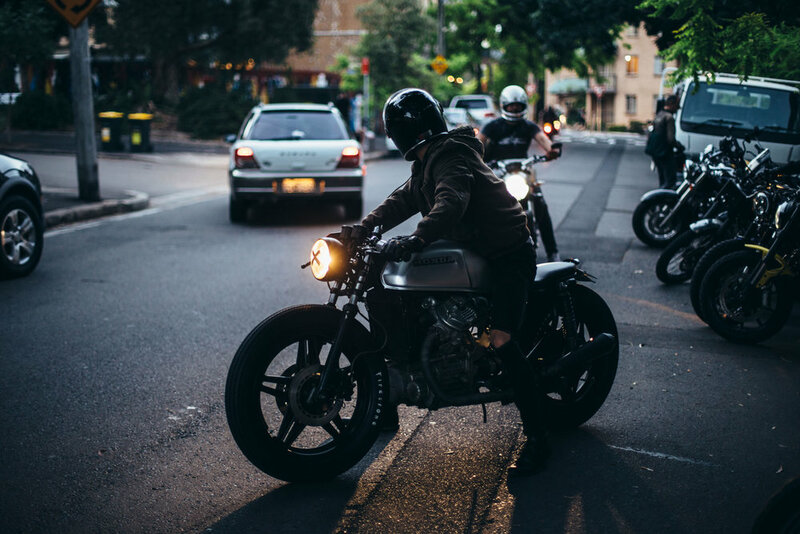 Lately I have actually worked on quite different projects recently - one called 'The Bar Series Sydney Edition'. This series is comprised of ten black and white watercolour; and felt tip pen illustrations which are to be showcases within a range of small bars located in Sydney. Another project I have been working on is quite different - cocktail menu illustrations. I’ve decided to carry through my black and white, intricately hand-drawn style to these pieces. 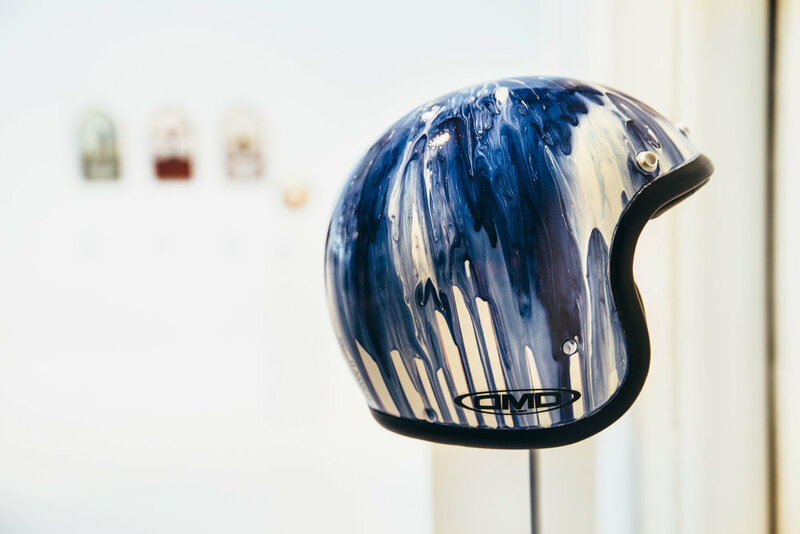 Inspired by the everyday magical moments, as well as climate and human driven catastrophes, artist Kevina-Jo Smith sets to work transforming everyday items of waste into works of art. 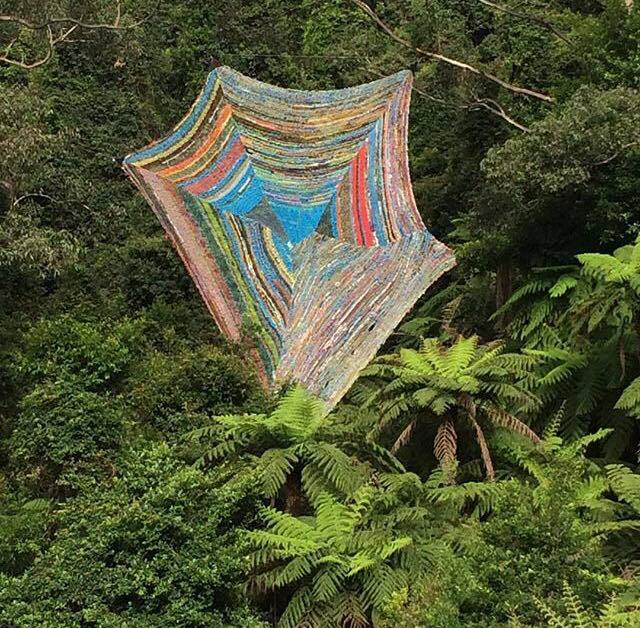 I recently had the chance to catch up with the artist to discuss sustainable living, her unusual art practice and her upcoming Vandal exhibition, Magic and Mayhem in Sydney. What does sustainable living mean to you, and how has it affected your life and art practice? I try to make thoughtful choices in my everyday life, sustainable living to me basically means to limit my contribution to the waste of energy and raw materials needed to produce cheap, single use products. Also to give back, contribute rather than use up and throw away. This is what led me to the challenge of using up-cycled and found materials, so as not to create more waste such as chemicals and single use packaging. It can get really frustrating and messy, sometimes it feels like a huge burden. I dream of being able to paint again, sometimes I cheat by collecting mis-tints and old paint, they are technically waste. You mentioned you used to paint: has the shift to your current use of found materials affected the motivation, focus and subject matter within your works? I think it did to begin with, because I focused more on figuring out how to use the materials and in what ways I could use them that were different to other waste art projects; I didn’t want to fall into that category. I guess, for a time I was more concentrating on the materials, but my original subjects definitely came back. I’ve still been working on those and just going deeper with them. 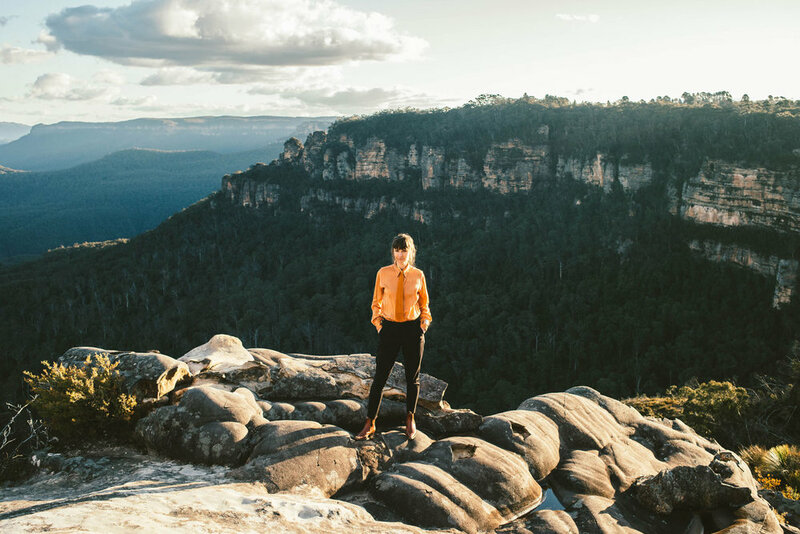 How has your move to the Blue Mountains affected your art practice? I moved to the Blue Mountains six and a half years ago; immediately I was inspired. I was high on fresh air for a while… I became addicted to the high rate of production within my practice. More recently, I appreciate that my practice still exists because I can afford to live here. I truly appreciate the headspace, but I always liked the idea of celebrating other artists achievements - we work hard! 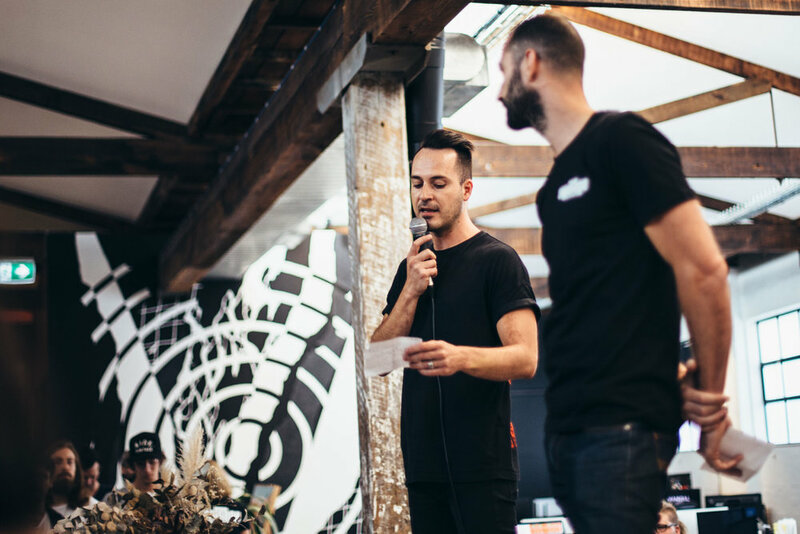 I do miss the creative communities I have had previously in Melbourne and Sydney, but I have an incredibly supportive community up here. In many ways being outside of a city makes me think more about being part of a broader, global artistic community. I have to work harder, but it’s ok, it’s all I want to do. Is there a theme or a particular idea you explored in creating the works for Magic and Mayhem? I always work to a theme. I get a bit lost in creating a world for the work to belong to. In the lead up to Magic and Mayhem I have been thinking a lot about trying to appreciate balance. Our everyday lives are full of distress and anxiety, we are consumed by social media and news platforms that are streaming natural disasters, humanitarian disasters, equality issues, climate and environment extremes, mass extinctions, domestic violence… there is no end. I guess I am trying to find balance and shift focus to some positives, such as new species being discovered and the rise of renewable energy support. But not just big things - tiny magic moments, rainbows, collecting and eating food that you have grown, laughing with loved ones. Celebrating the small stuff to give you energy to deal with the big stuff. My work has always been about different forms of protection and shelter, I began by looking at it from a very selfish point of view… a lot of self-portraits and self-analysis which developed into struggling with how to protect everything. Clean water, forests, oceans, animals. Everything. Most of my works are abstracted forms of shelter, such as clothing and structures. What feelings would you like the exhibition to inspire in its audiences? What messages would you like them to take away? I was thinking about this actually. I guess a sense of comfort, the way I try and represent the feeling of protection or the idea of shelter. I want to make people feel secure and comfortable but also more aware and conscious. Within the growing awareness, but making it approachable. It seems like a lot of people are afraid to make changes, so I guess making it more approachable and making people more aware. Your works are very impressive! What tools and materials do you use most? Which are your favourite? Thank you! My main tool, at the moment, is my hands. The materials are predominantly rubbish. It’s hard to have a favourite. I have a few people in my life who collect incessantly. For me, my lifestyle choices don’t really produce much waste, so I enlist people to save bits and pieces for me. I guess I observe materials for their texture, colour and availability. For example, I was recently making beads from straws and lollipop sticks because they are everywhere on the ground, at the beach etc. I guess when I see something on repeat I start to formulate ideas through the frustration. I remember at one point my partner and I were buying a lot of oranges at the fruit market, so I was making various things with the fluoro plastic string bags: sewing them together, weaving through them. I did a series inspired by the Japanese art of Kokedama. Instead of wrapping the root ball in string, I nestled plants into the string bags and strung them up. I guess my tools and materials evolve depending on what is being wasted around me. I look for solutions. It was a tough search, but Art Pharmacy Consulting and FACS finally found our photographers! Alongside Family & Community Services (FACS), Art Pharmacy are preparing for a groundbreaking new photographic exhibition to be shown in NSW Parliament House early 2018. Art Pharmacy Consulting was engaged to choose five talented regional photographers to create photographic artworks for the Art of Ageing Exhibition 2018. 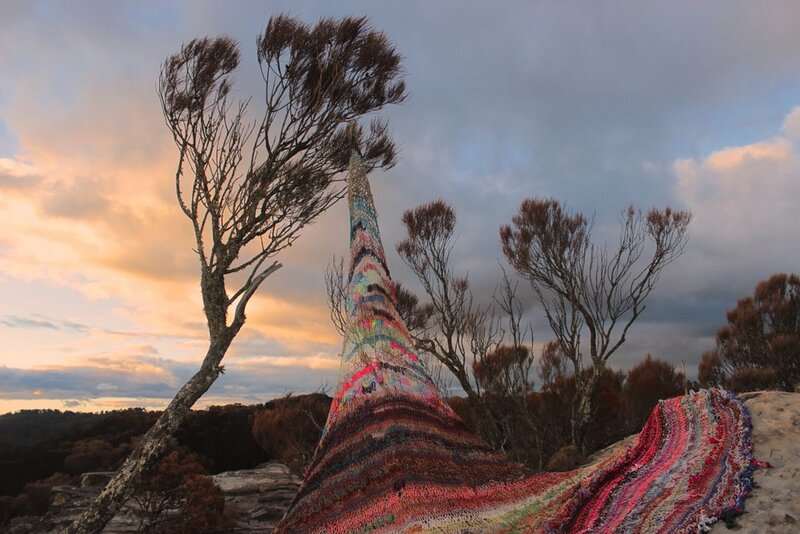 Tayla Martin (Wagga Wagga), Tim White (Mudgee), Tina Milson (Yarra) Julie Slavin (Taree) and Kerri Ambler (Orange) are the talented regional photographers who made the cut. They have begun researching local stories and characters that break ageist and normative visual stereotypes. 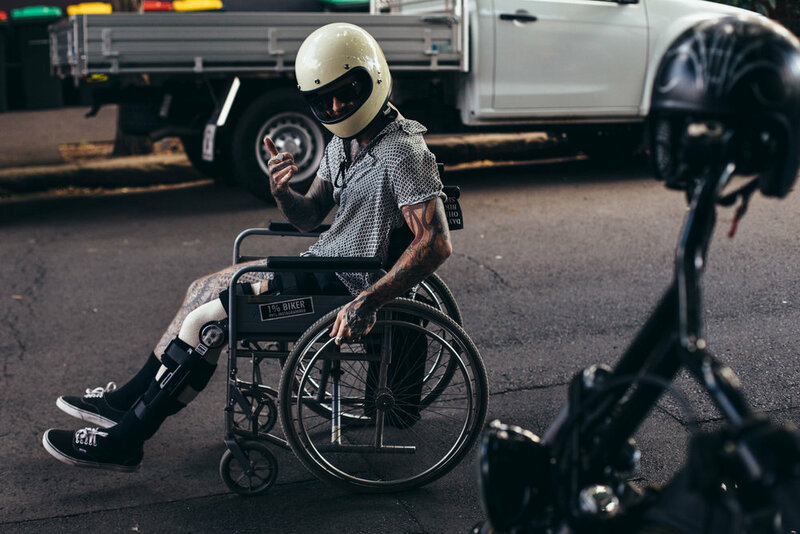 With a growing ageing population in NSW, this exhibition will aim to challenge the stereotypes surrounding the ageing population, with a series of 30 images by the photographers. It will show the unique and diverse ways in which older people can contribute to, and enhance communities. Each photograph will be accompanied by a short story, highlighting the subject’s experiences and reflections on ageing. Through social media and with the help of various regional galleries, we’ve confirmed a group of regional based photographers for the exhibition. 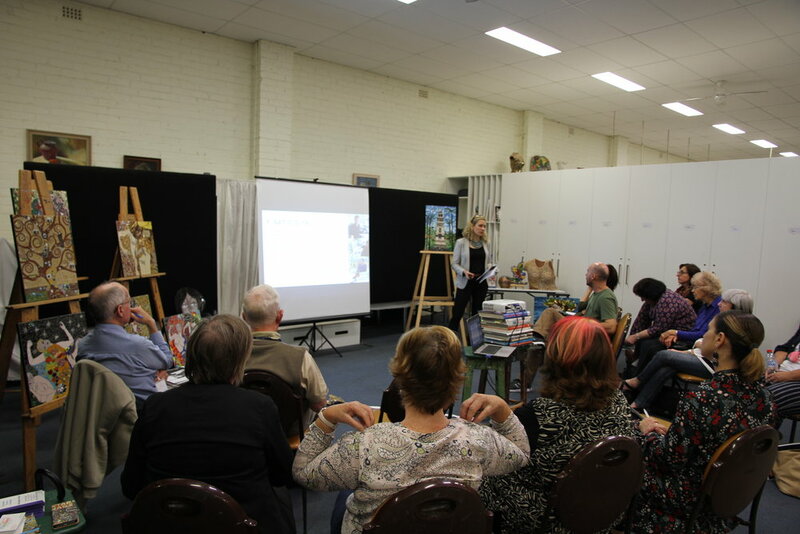 The goal will be to show a variety of cultures and backgrounds; covering topics which support the NSW Ageing policy. 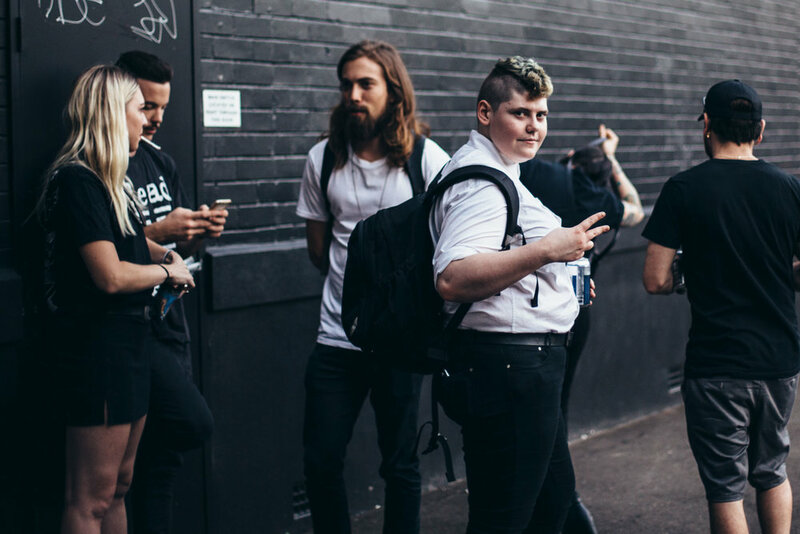 This includes intergenerational experiences, elderly people living with disabilities, Aboriginal and Torres Strait Islanders, connecting with Art & Culture, life in rural & remote areas, Gay, Lesbian, Bisexual, transgender or otherwise LGBTIQ+ identifying. Stay posted for more updates on our photographers throughout the year! Constructivism, a movement originating from Russia, was born with the optimistic feelings of revolution. It took on board quintessential aspects of modernism such as minimalism, avant-garde and Marxist theories, while being very much in its own sphere. Heide Gallery in Melbourne is hosting a constructivist exhibition - but with an Australian and international twist. 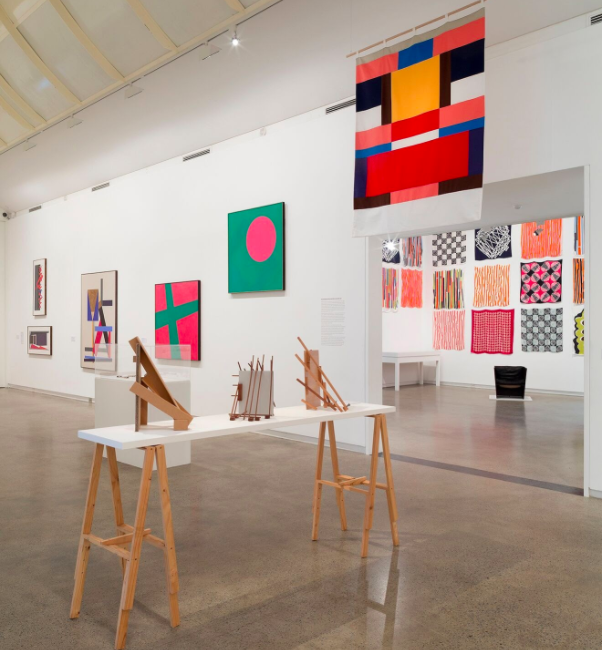 The show contains an impressive mix of both Australian and international artists who have embraced the colourful and minimalistic styles of constructivism over the last 100 years. The breadth of practice displayed in this survey truly opens our interpretation to what art can include; bringing painting and sculpture into the realm of functionality and design. 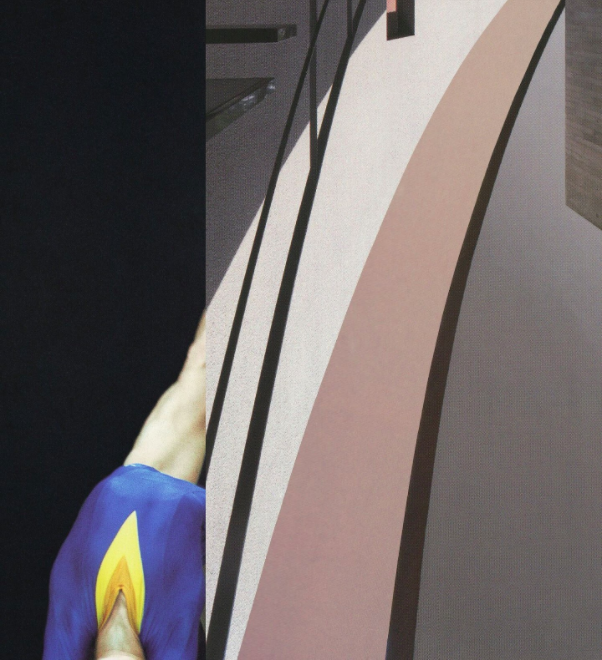 Recently I interviewed curator Lesley Harding about how Constructivism has had such a lasting impact on Australian art. Kelsey Neumann: What drew you to Constructivism for this exhibition? 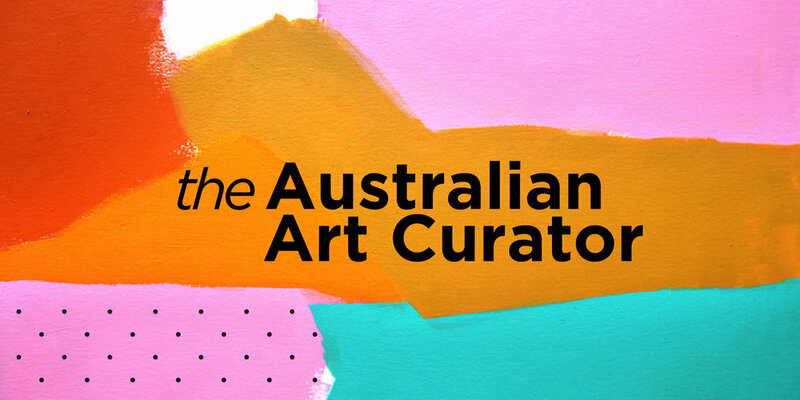 Lesley Harding: Sue Cramer, my co-curator, and I had worked on an exhibition a few years ago in 2009 called Cubism and Australian Art and we followed that up with an exhibition on minimalism and postminimalism. We thought, given the 100th anniversary of the Russian revolution, that [constructivism] would be a really interesting thread to follow through Australian art. 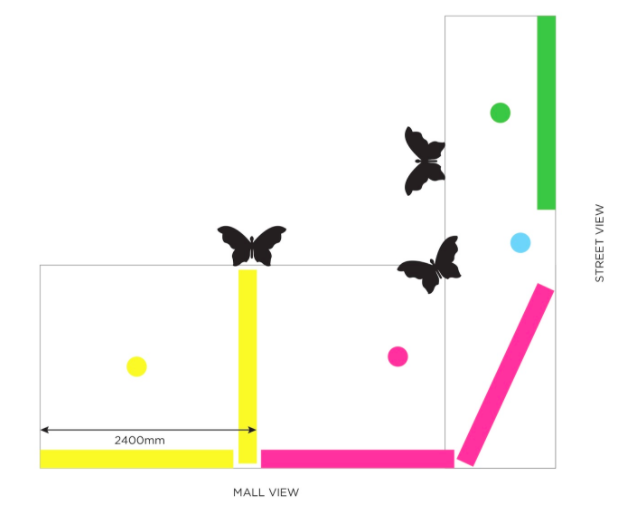 So, the context is a large, thematic, cross generational, survey exhibition. The beauty of constructivism is it is a very cross disciplinary art movement, changing and metaphorizing away from Russia very quickly which is what we now call international constructivism. It’s a complex, and I think very interesting story, giving the ability to dig around and find new things to say about some of our most celebrated artists. KN: Being such a European focused movement, how did it gain influence in Australian? LH: Well that has a twofold answer. The first wave of constructivism in Australian Art happened in the 1930s but it was deviated from the original Russian movement. A number of Russian artists, particularly people like Naum Gabo, travelled around Europe and America having quite an impact on artists interested in abstraction. So, Australian artists like Frank Hinder had worked in America and saw examples of international constructivism, bringing those ideas and contacts to Sydney. In the 1940s Ralph Balson had his first solo exhibition in Australia of constructive paintings using what he learnt from Hinder. This aspect is represented the Heidi 2 building looks at the arrival of international constructivist ideas in the late 1930s up until the 1960s. The second part to the answer is that by the 1960s there was quite a lot of research into the original constructivist movement and a couple of really important books came out. 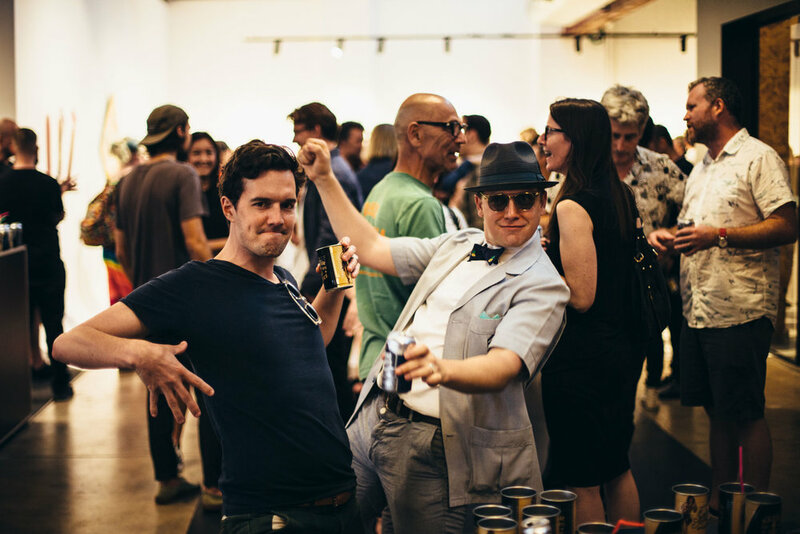 Australian artists became interested in the original movement, going right back to the source. Russian constructivist were interested in what the role of artists might be in the new regime, forming the productivist phase which is really about integrating art and the everyday. 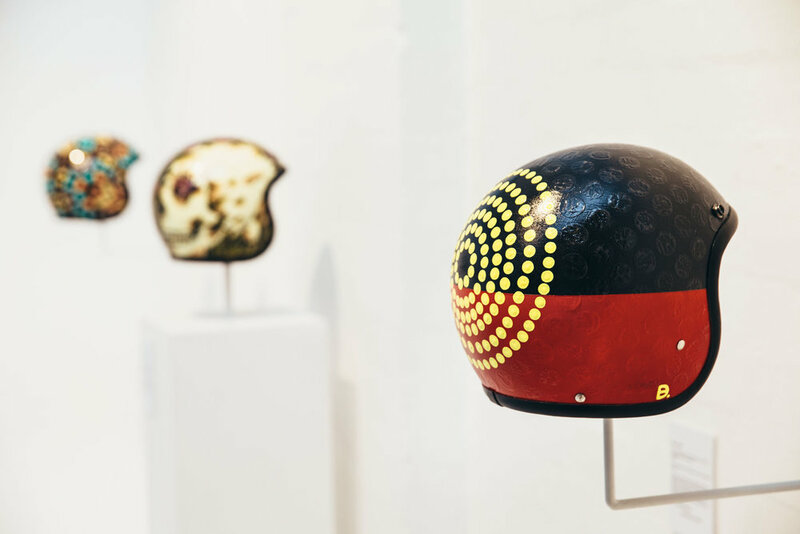 Australian artists from the 60s onwards were interested in this, a selection of works from this period are displayed in our main Central Gallery. KN: You mentioned art changing into a social construct in design. 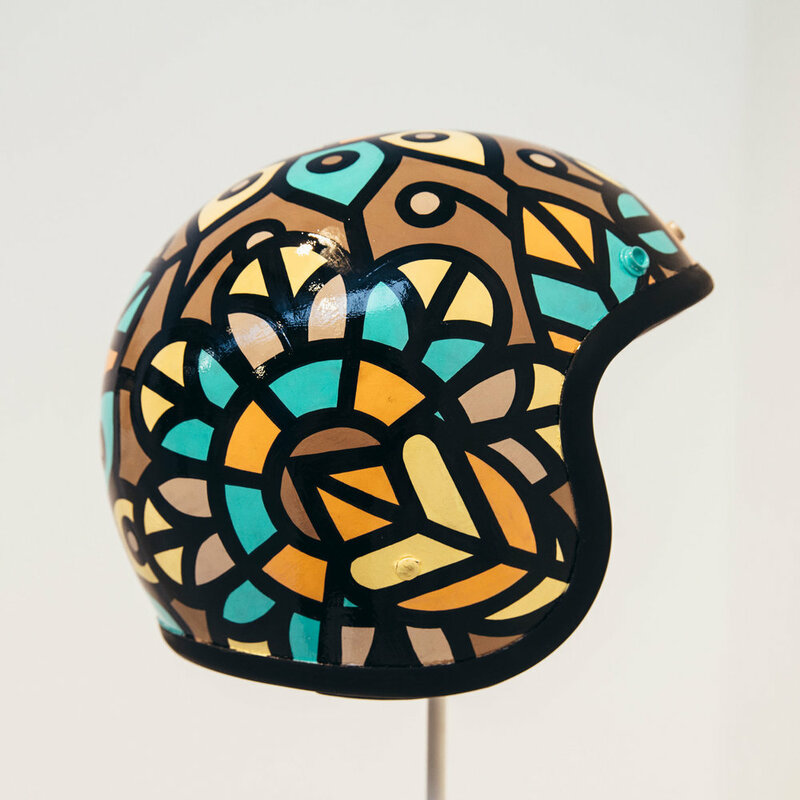 Could you elaborate on how you went about combining art and design in this exhibition and how you chose the works? LH: The Russian movement was concerned with art having a vital role in everyday culture. There was a sense among this group of artists that their role could be reprised and art would be integrated with everyday life. That included reaching as many people as possible through theatre. We have got some of Frank Hinders stage designs from the 1960s, which he created for the Russian play The Bedbug. Following from this contemporary artist Esther Stuart worked with the design house Valentino so we have a Valentino, Esther Stuart coat in the show. Propaganda design also played an important role so we have some examples of original materials in the show. This includes an exquisite, but tiny, broach by Rodchenko and ‘Coffee cup and saucer’ by Kandinsky. KN: When choosing artist for the exhibition, where you focused more on an Australian perspective or a more holistic survey? LH: We very much took the Australian response to both Russian and International constructivism giving it a theme seen through Australian art. We have got examples of the original movement but we only drew upon Australian collections when choosing those works. This is important in terms of the way that more recent artists interpreted constructivism. The foresight that someone like James Olsen had in buying those original works had an impact on the development of contemporary art in Australia. The international examples included in the show are touchstones, displayed with more recent selections so people can see understands the relationships. 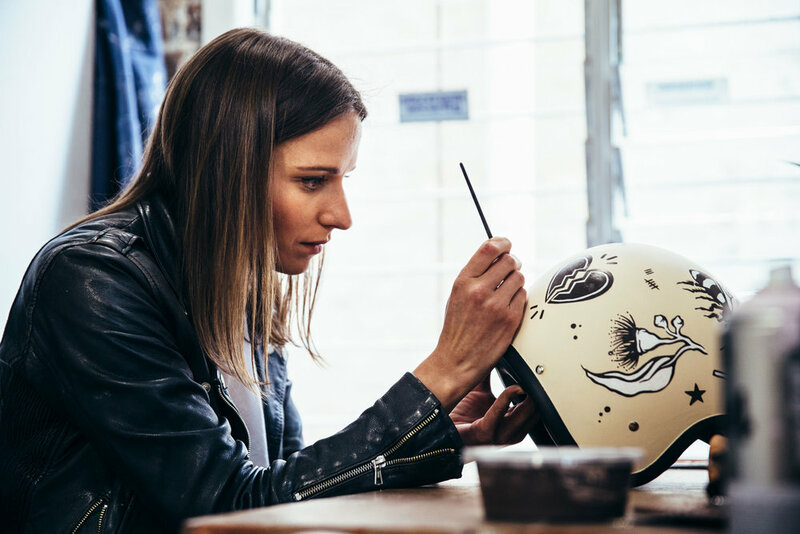 After stumbling over a cow skull on her commute to university in Wagga, Jennifer Hesketh became fascinated with anatomy, a passion that would later inspire Quirky Bones. With an eye for technical accuracy and an interest in what lies beneath the skin, Jennifer’s creativity flourished in ways she never had expected. I guess for me, as a full-time worker, most of my downtime is spent doing what I do for Quirky Bones; it’s the only time I get to do it. So, most of the time when I get home, I’m working on something like that, even if it's replying to emails or painting something or sketching ideas; it is a lot of my free time. For example, most of the work for my solo show was completed on the train - that’s when I had the time. Forty-five minutes goes a long way to being able to finish something like that off. Just using all the time I can spare to finish works off or to develop them further. Have you always seen yourself as an artist? No. It was never something I really thought about, at all. I knew it was a possibility that it could be achievable or that it could still be a part of my life but I didn’t know what why it would. I guess, my Mum and Dad are creative, so that’s come from them, I’ve sort of followed suit. My Mum makes clothes, she’s also a good cook, Dad’s a civil engineer and he draws a lot of bridges, things like that. But they have more of a practicality rather than being a more fun/ passion project. When I was going to uni, I’d always thought I’d end up in animation and animation only. I never thought I’d ever go in this sort of direction. Instead, being creative is something on the side, a project I work towards in my spare time whilst also having a full-time job. It’s funny how it’s all worked out. At this point I’m looking for that creative job that I can make money from. I’d like to shift the balance, rather than working in retail and being creative on the side, having a full-time job in which I can be creative in. Many of your artworks are inspired by the anatomy of both humans and animals, what drew you to this subject matter? I was very big into the gothic subculture in high-school, so I guess that’s when the iconography started. 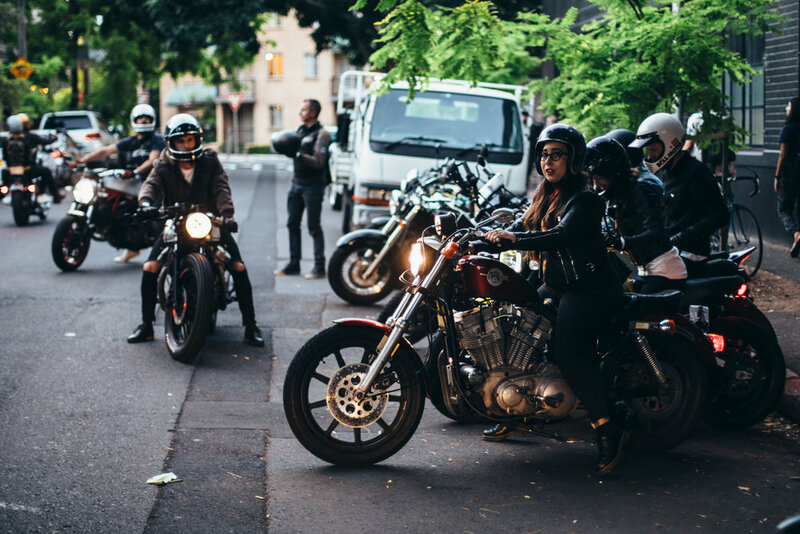 You always see skulls in that subculture world. So, the initial interest was brewing there. That’s your immortality and that’s what will outlive you, making that connection that these are the things we leave behind, so what can I leave behind other than my bones? I haven’t quite reached the stage where I look at a person and think about what their bones look like, so that’s a good sign. When you have a creative block, how do you get past it? I often sleep, it’s so lazy, but I sleep. I think, for me, if I feel overwhelmed, I can’t do anything. I just go completely blank; I don’t think sleeping is a bad way to deal with it. If you don’t want to think about something then why think about it? Why push yourself to the max, and pressure yourself to finish something off, when it’s not making you happy? I think, if you’re making a piece and you’re not feeling it, taking that large step back and coming back to it later, or even brewing on an idea. On many occasions, I’ve brewed on an idea for days and then thought, I should have done this or used the object in this way, rather than how I originally intended. And it’s only after allowing yourself that space that you can really consider other ideas. Going to museums is another way to get past it, seeing how other people have done things, how they’ve created the idea you’ve been brewing on in a different way. A lot of ideas I have come from things I see, I ask myself, ‘how can I do that but make it more of something I’d like to see?” And I think it’s only after seeing your idea being done beforehand, that’s how you can change the idea and develop it further. I also spend a lot of time online, I binge watch Netflix or I go for a walk. I take myself out of the environment and the stress of the project I’m working on to give myself space and time to reconsider my ideas and generally have a break from it. How has your history in photography affected your art practice? I wasn’t sure how to think about this question because I’m not sure that it has affected me or not. However, one thing that does come to mind is composition. When I work on a project I look at the pieces as individual objects: it’s not whole until after I put it all into the frame. I more or less see it as two separate pieces, the hand and the skull, and that’s how I think of it in the beginning. But by working on the composition, putting two and two together and working out where the hand sits and where the skull sits, and if it sits underneath the chin of something or the beak of something that’s kind of the way my eye works. And that’s the same within a photographic image, you’re thinking about the person and then the object, or you’re thinking about where the apple is and where the vase is. It’s not a whole in the beginning but when you’re taking it back and putting it within the frame, that’s when you see the composition. Can you walk us through your art practice? How do you come up with ideas, imagery and compositions? Part of the few pieces I have at Art Pharmacy are the crutches and the badminton bats, putting the anatomy of the human leg into the crutches, because that makes sense. How would the crutches have a different practical use? How can I turn them into something different that would be appealing and extend its lifetime? Those crutches will now still be used, but not for their original intention. Another material I use is cardboard, in a way, like the abandoned objects, I’m extending its life; but for me cardboard also resonates with the fact that it can change over time. Skulls can discolour, or break, or decompose over time and so will cardboard if you put it in the elements, it will change over time. That decomposition of the imagery itself as well as the decomposition of the subject matter, the change will come. Those changes of the subject matter as well as the canvas it's painted on are a big part of the practice. You can see all of Quirky Bones' works for sale here. 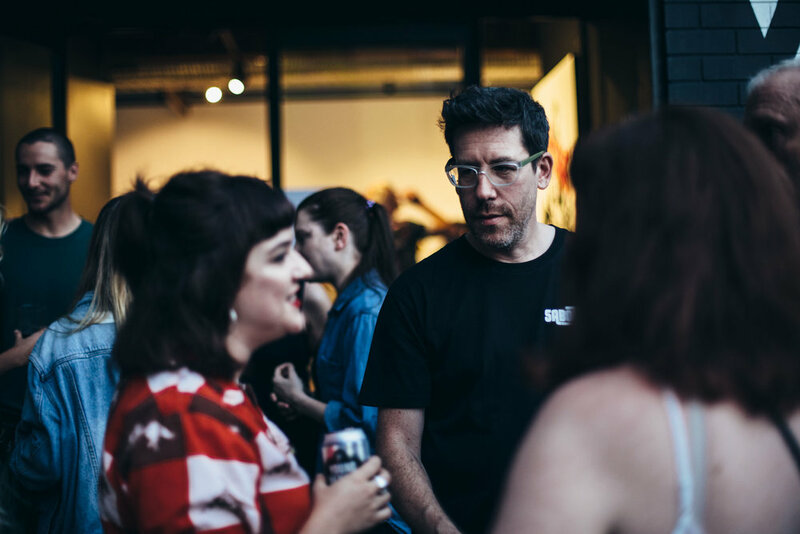 Tuesday evening saw the return of the artist Joel Dickens with the emotive ‘Pressure Sensitive’ exhibition at V∆ND∆L Gallery in Redfern. 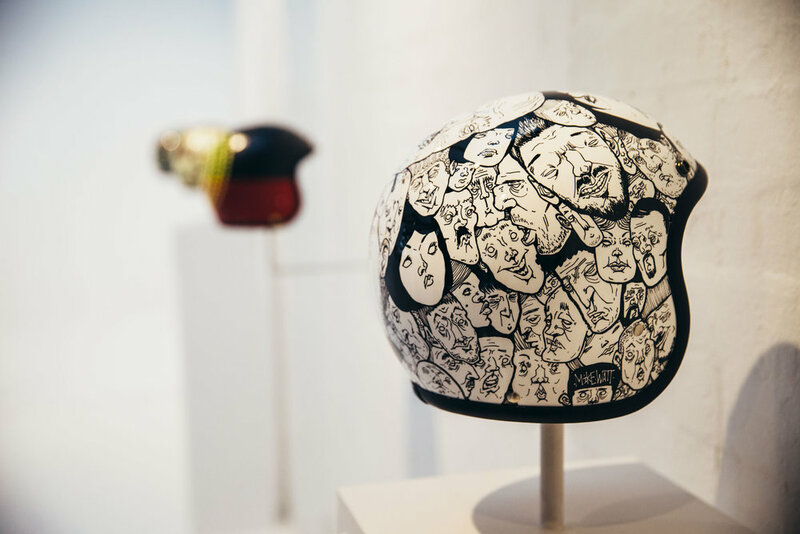 He presents a collection of fascinating works in his exhibition ‘Pressure Sensitive’ at VANDAL Gallery which evoke a sense of tension between various sets of dichotomies. 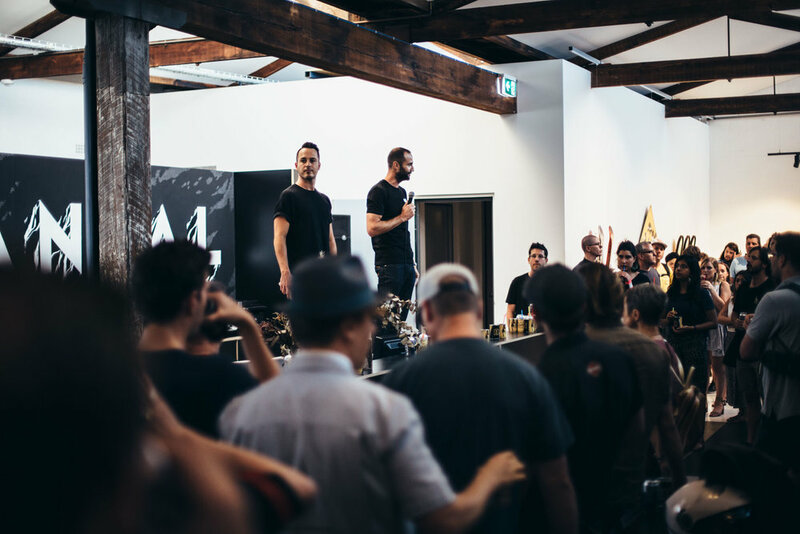 In a speech to attendees on the night, Joel Dickens explained that the approach to his works was tempered after several brain surgeries, but also the birth of his twin children. Through his process, Joel consciously challenges himself and his usual practice in an effort to acknowledge the complexities of adulthood, while referencing the sense of spontaneity and lack of inhibition that is habitual to youth. In his bright, raw works he reconciles a personal truth that is both personal and broadly relatable in that nothing is really black and white. The works exists in the realm of thought where one can simultaneously acknowledge multiple possibilities while never fully submitting to one. 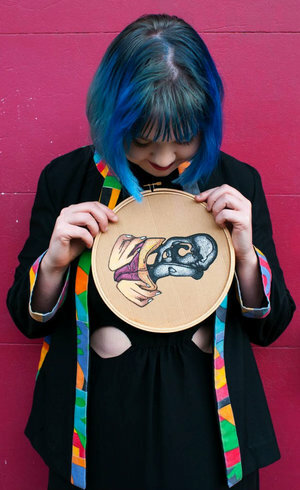 Melanie Booth: Can you tell me a little bit about the process of creating these works? Is the colour of the ‘squiggle’ we see on the surface actually the base layer of paint? Joel Dickens: Yes that’s a base layer - there will be a number of those layers that will be put down to get it to the right opacity. Then the oil layer is put over the top. It’s about trying to get the right balance in the oil so that it’s not too oily and drips. There’s definitely a time factor. M: It sounds like quite a painstaking process. At first I thought the squiggle was done over the top of a block colour background. J: That’s sort of what I wanted. People seeing it from a distance and thinking it’s a solid line then realising it's quite raw. The process has been developed: what seems like a very emotional, spontaneous gesture actually takes quite a long time to produce. M: Do you find that process quite meditative? J: In a strange way it’s kind of nerve racking. You take a while to plan it but you never really know how it’s going to pan out. It is kind of meditative, more so than expressionistic but it’s essentially a race against time. You’re sort of volunteering yourself for a stressful six hours. The preparation of the canvas takes a few days but the actual gesture is done in one sitting. M: You mentioned in your artist statement that these are paintings you feel you need to paint, not ones that you necessarily want to. 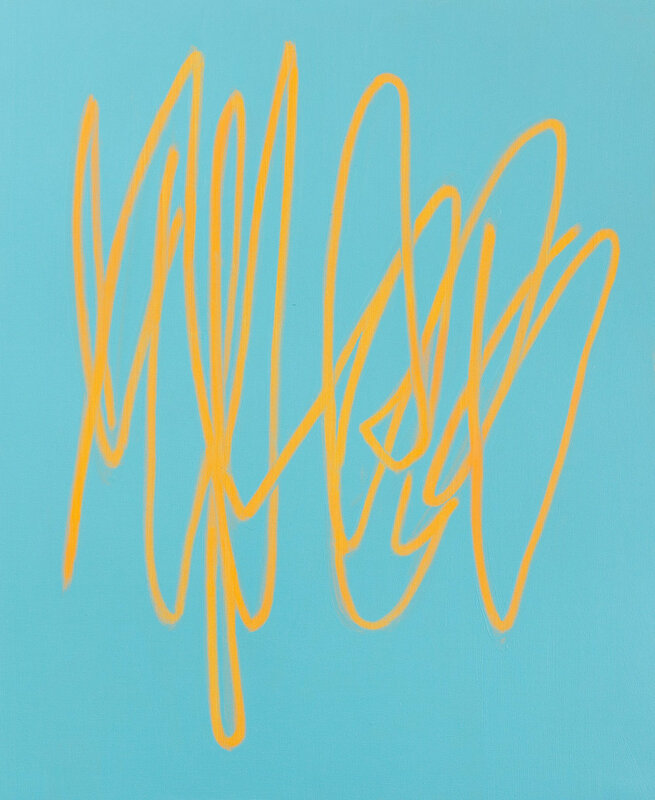 J: I have a certain set of criteria in my work: I wanted to take the indulgence of the mark making out of this series. It’s something I feel quite strongly about. M: Is this because if you were to just do a scribble of paint, that would be too easy? J: I love children’s art and scribbles, but I’m not a child. It’s paying homage to that spontaneity, but recognising the struggles and tensions of becoming an adult. I wanted to take that inhibition to an extreme point. It’s also the conceit in the work: it looks like they’re produced quickly, but they’re not. That’s the tension I’m trying to create for the viewer. M: Do you plan the form of the scribble? J: No, not really. The actual scribble shape is quite spontaneous. There could be something on the TV or something political that inspires it. It’s about choosing that kind of specific event and then trying to be as spontaneous with that initial gesture as possible. M: Do you often work with this kind of style? J: I used to do a lot more of throwing paint around. My last exhibition was close to four years ago and a lot has changed since then. I think where it has come from in terms of responding to these immediate events is the same, but the response has been different. M: Do you feel these works come from a personal place or speak more generally about the human condition? J: I feel they’re both micro and macro. Some of them are deeply personal. I like to think that there’s something philosophical about them as well and that they can be appreciated on that level. M: You mentioned that you have undergone a few medical procedures recently. Has your concerns with your physical health and the effect on your family influenced these works? J: Yes, definitely. I believe that everything in your environment affects you and hence your work. With the health thing, it really did make me consider my own mortality and I think the work sort of mirrors two things – an appreciation of life but also a fear of death. It bridges both things. It’s me wanting to get stuff done quickly in case something happens tomorrow, but there’s also a defiance in the work in taking my time and engaging in a laborious process. M: You’ve mentioned the act of ‘bridging’ contrasting concepts several times. Is this a predominant theme in this exhibition? J: I see things in the grey quite a lot. I don’t know whether it’s an age thing. Actually I’m not too sure. I’m very conscious and scared about people sitting on the fence, but I find myself sitting on the fence on so many different things. In a way this is me sitting on the fence between a meditative, philosophical approach and an expressionistic one. I think someone said that truth lies between two extremes. If there is a truth, then it exists between those areas – which I’ve consciously tried to reconcile. There’s nothing that gets you excited for the weekend, like the prospects of taking the family on a graveyard visit. Sounds like an oddly morbid choice after a long working week? Taking place in Rookwood Cemetery, Lidcombe, HIDDEN 2017 is an outdoor sculpture exhibition that takes place amongst the gardens and graves in one of the oldest sections. Forty-two artworks are hidden amongst the graves - a pile of plaster bones, pearly gates, fallen poppy petals made out of glazed red stone. Fascinating and uncanny, the artworks touchingly focus upon the importance of commemorative events to celebrate love and life. Particularly loved Tully Arnot’s Exhalations - a multi-channel soundscape. According to Arnot, ‘the haunting sounds created by the artwork explore themes of loss, longing and absence … designed to create a fleeting experience of the artwork’. 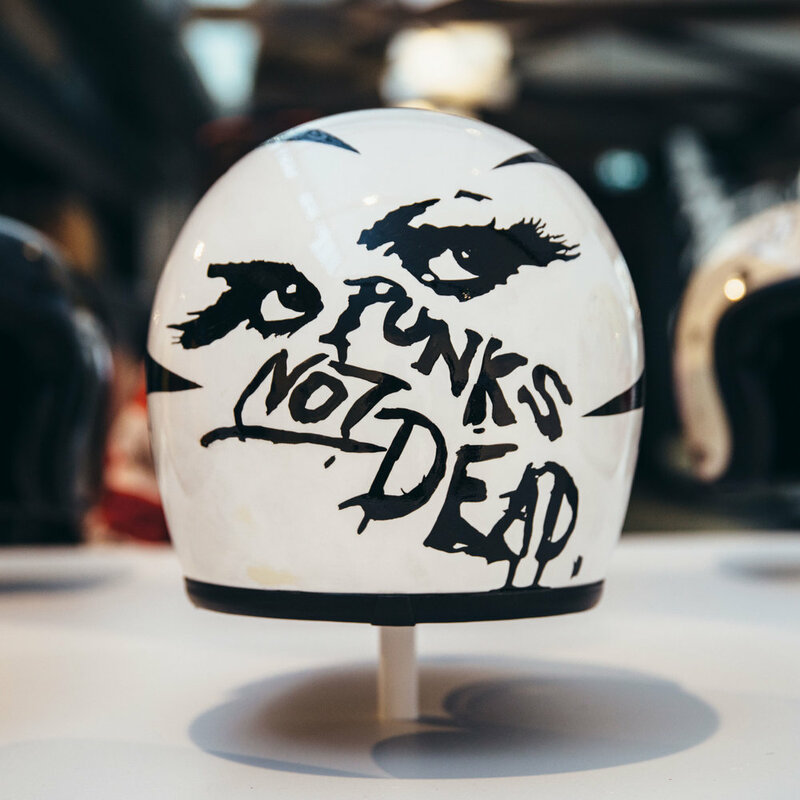 If you’re tired of the same old, and looking for an exhibition with a twist you should definitely check this one out. “Children unleash scribble in a moment of uninhibited, spontaneous, emotional expression - subconscious, absent-minded and pure. Here, childlike and spontaneous gestures are constricted by the neuroses of adulthood. The paint never reaches the boundary; staying within the lines. Identity is restricted by the adult ego, and passions are sacrificed to the day-to-day realities of life. Good intentions meet their limitations. A nervous breakdown that you’re not allowed to have. The paintings are created by laying many layers of paint, before meticulously chipping away to create a calculated expression of hi-key emotional outburst. 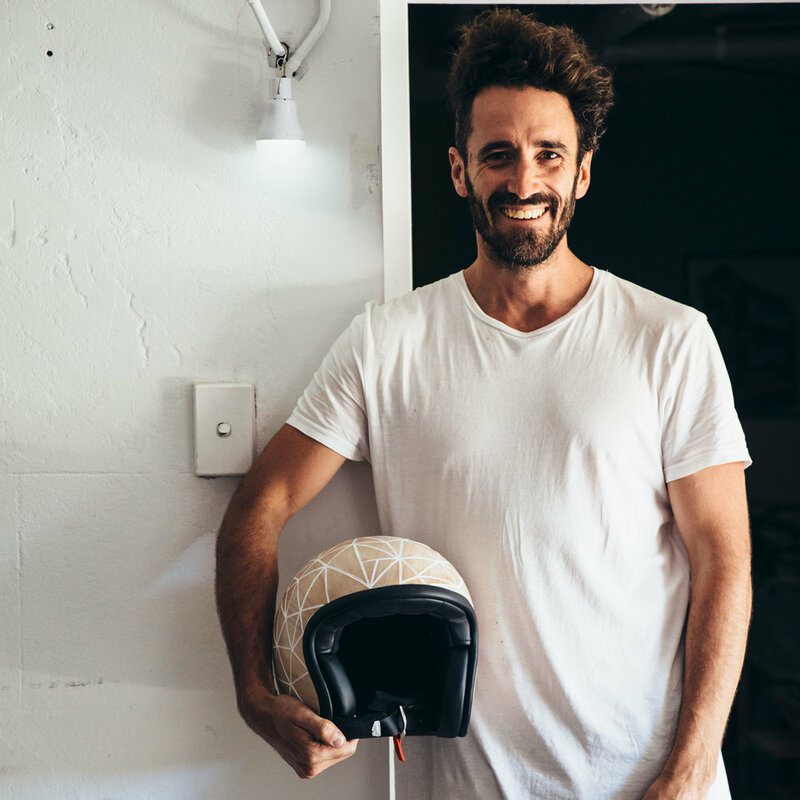 Over the past couple of years Joel has experienced a number of confronting events which have both inspired and hindered his practice. ‘Pressure Sensitive’, is a series of works made around these events, the title alluding to this period in the artist’s life. This exhibition at Vandal Gallery will be the first time these new works have been shown as a series, showcasing his new approach and marking a new period in the artist's career. Art Pharmacy writer, Karl Sagraab sat down with Joel to discuss how he came to create ‘Pressure Sensitive’. What made you decide you wanted to be a painter? I saw a photo, when I was about 15, of Guernica hanging at the UN which made an impression on me. It suggested to me, that painting could make a difference in some way, and that's what I wanted to do. It turned out that Guernica was a tapestry copy and that the UN is less than perfect, but at the time it pulled two things together in my mind, art and wanting to make the world a better place. I'm a bit more cynical now but I continue to believe that art can make a difference to people's thinking and that the ripple-effect from one person's interaction with an artwork or book, upon society, can be significant. Can you describe your practice, your use of medium and material, for the series of works in Pressure Sensitive? Like most artists I struggle to find the amount of time I would like to paint. I have a family, a house and a day job. In this way the work has a performative aspect to it, inasmuch as it is created within and in reaction to life's events. Time to paint is snatched from the jaws of everyday responsibilities and the work is, in no small way, inspired by this predicament. In terms of medium, I use both acrylic and oil; a number of layers of acrylic underpainting and then an oil layer which I extract the gesture from. 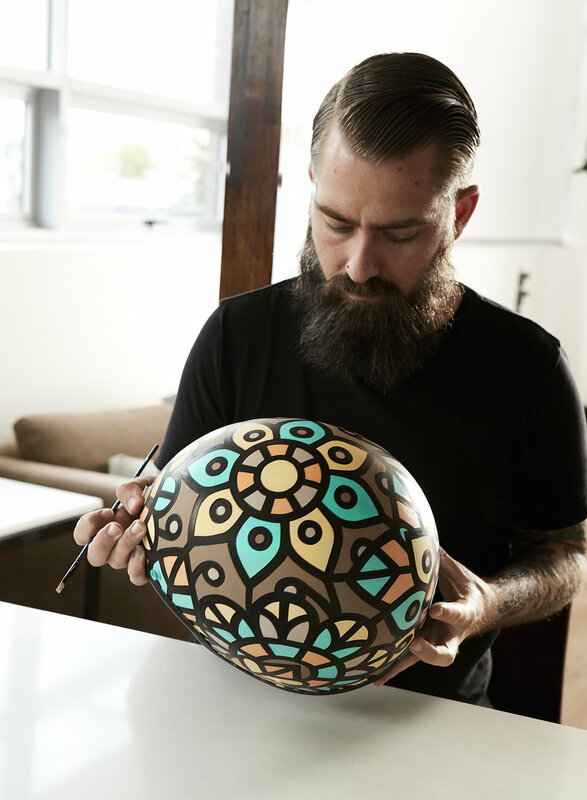 The title refers to both the technique of the production and the environment the work is painted in. 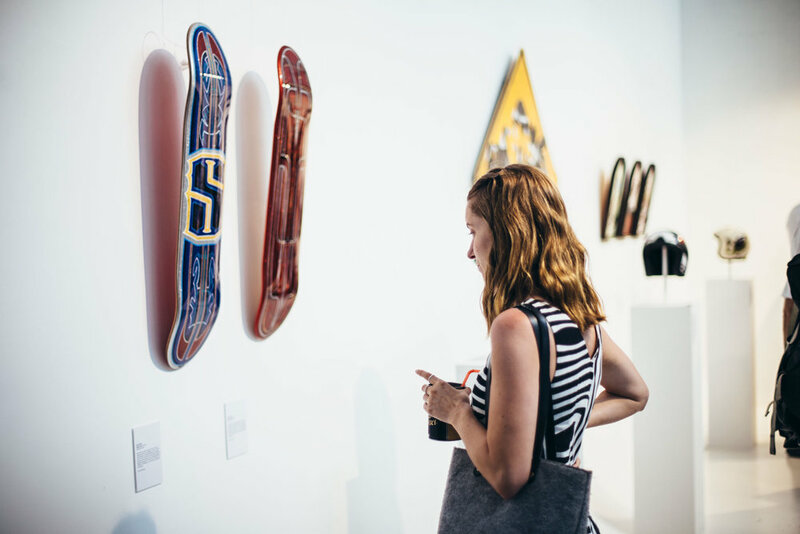 Did you have an underlying theme in mind when creating the works or did they come about individually and come together in exhibition form in the end? In other words, was there a particular inspiration for these works? The inspiration for each work can differ dramatically. As with previous work, they are painted in reaction to events, be they personal, political or environmental. With this work now, however, there is a greater emphasis on the language, the motif, which I've spent a few years developing and arriving at. The individual works are painted in their own space and time and in response to a particular event. But the exhibition might be read as a series of diary entries, scribbled utterances, or a cross section sample of one person's existence. 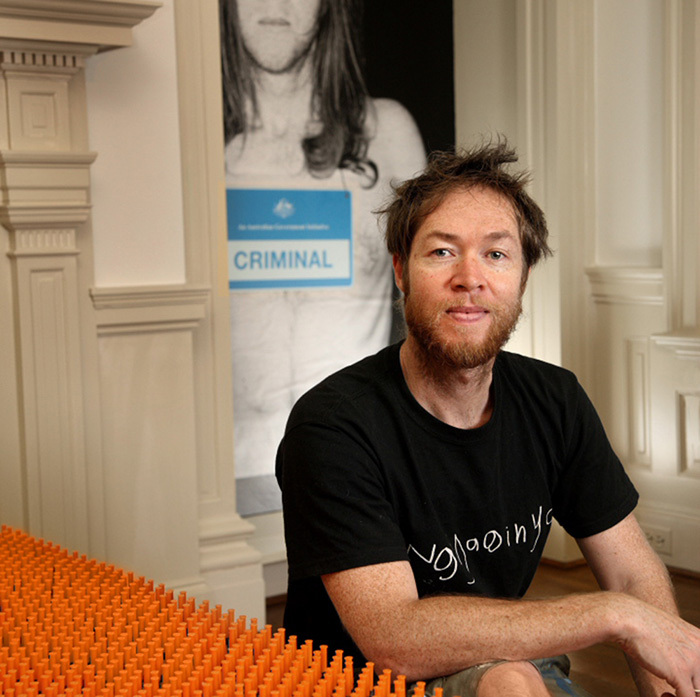 This exhibition is in Sydney but do you have a favourite place to exhibit your works? I had a couple of exhibitions in Buenos Aires which was exciting. There's a vibrant painting scene there and, for some reason, my work went down well. In terms of where it ends up, my work has been bought for display in foyers and restaurants. It gives me a kick when the work can be seen in public spaces, where the viewers are many and constantly changing. Are there any painters or artists that inspire or influence you and you work? Vandal Gallery will be hosting the opening of Pressure Sensitive on Tuesday 5th of September.